“It has not been a walk in the park,” admits Heidi Uustalu, the head of Kiviõli’s 1st Secondary School. Kiviõli is a small, largely Russian-speaking town in Eastern Estonia where about 5200 people live. In 2013, in the face of a dwindling population, it merged its Russian and Estonian secondary schools into one. Deciding which language to use in schools has been a contentious issue for the Baltic states of Latvia and Estonia for decades. When regaining independence in the early nineties, they inherited large number of the mainly Russian-speaking minorities which were resettled in the countries with intention to Russify them during the 50 years of Soviet occupation. Every fourth inhabitant in Latvia and Estonia is Russian. The states pay for education in minority languages, but to ensure integration schools have to teach a certain proportion of the curricula in Latvian or Estonian (currently 60 percent in the state language and 40 percent in minority languages). In 2018, before the elections, the Latvian parliament adopted stricter rules that will require primary schools to switch to an 80/20 proportion, but in secondary schools all subjects, except minority language, culture and history, will have to be taught in Latvian. Estonians have gone for a softer approach. Minority students can immerse themselves in Estonian secondary schools and learn in the 60/40 model. Unlike the rules adopted by the Latvian parliament, primary schools in Estonia have no regulation in which language to teach. Thus every 6th primary school in Estonia teaches kids exclusively in Russian. Uustalu admits that the school has been struggling to make it work with students from different backgrounds, but step-by-step has worked it out as there has not been a manual on how to handle the merger. That’s why the whole thing is considered an experiment. She does not deny that the reform, with roots back to 1993, has put a lot of pressure on schools. “Unfortunately, as a teacher, I cannot teach all the students the same. 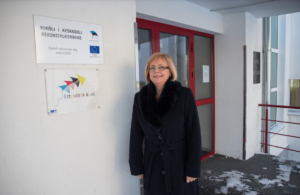 Because of their poor Estonian language skills, I always need to look at the students with Russian background separately,” said Anu Vau, who has taught Estonian language and literature in Kiviõli for the past 11 years. In her opinion, even studying 60 percent of the subjects in Estonian is too much for students coming from primary schools that teach only in Russian. “They come here with good grades, but their language skills are poor,” Vau said. This means that, for example, during group work teachers separate Estonian and Russian students. Simply put, it’s easier for everyone. Heidi Uustalu, the head of Kiviõli’s 1st Secondary School. Photo: Meelis Meilbaum, Eesti Meedia. According to law, at least 60 percent of all subjects are taught in Estonian when children reach secondary school, but there are no language requirements in primary schools. So Russian children may need to jump from everyday conversations to learning physics in Estonian, but the “united school” is not easy for Estonian youngsters, either. Ana Amanov, an 18-year old from Sonda Parish, finished her nine primary years in Estonian. A logical choice for secondary school would be Kiviõli, a 10-minute car ride from her home. But she did not want to do so because it is known as a “Russian school”. Since the merger of two schools, the school has had two parallel curricula in the secondary level – one with subjects only in Estonian, the other with the 60/40 model for students coming from Russian schools. “I was afraid that the others wouldn’t accept me because of my poor Russian skills,” she admitted. Instead she opted for another school in Rakvere, 30 kilometres from her home, but it didn’t work out. She had to return to the school she at first dismissed. Now, as a 12th grader in Kiviõli, she says that none of her fears of blending in materialised. Although Russian and Estonian students still tend to mingle in their own groups, they get on well and are more than willing to learn about each other’s language. If they cannot understand something, kids either go to Google translate or switch to English. These so called “2 in 1” schools were not a goal in itself. The reason behind the “experiment” was rather practical. Students prefer going to a secondary school in bigger cities like Tallinn and Tartu. Urbanization is a general trend, not only among students but families as a whole. Estonia’s capital Tallinn has been growing rapidly, with roughly one-third of the country’s population now living there. It has had a deadly impact on schools in rural areas. Some were forced to shut their doors. Now, there are nine of these “experimental” secondary schools, sized between 100 – 530 children in each. They can choose to learn either in Estonian, or switch to 60/40. Arne Piirimägi-Kiviõli’s school principal at the time when the two schools were merged. Photo: Meelis Meilbaum, Eesti Meedia. Arne Piirimägi, who was Kiviõli’s school principal when the two schools were merged, is now leading Peipsi Gümnaasium. 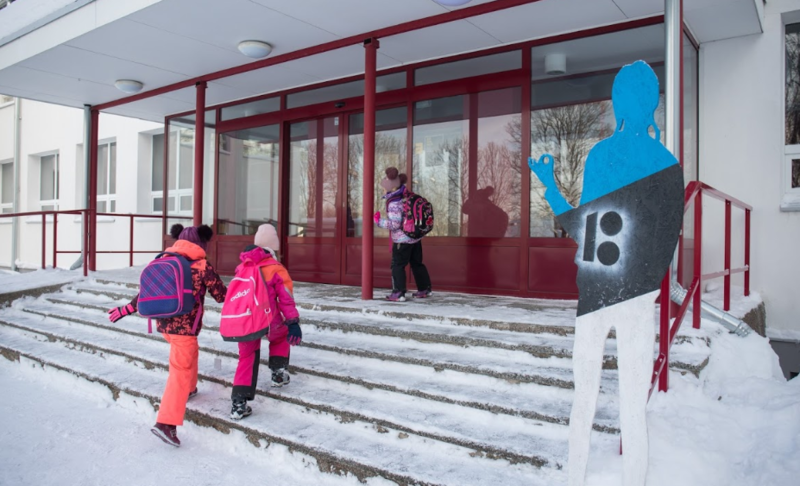 After getting the joint secondary school up and running in Kiviõli, Piirimägi decided to move to another Russian-speaking area where another merger was happening. The school is located in Mustvee – a tiny town with a thousand inhabitants, next to lake Peipsi. There are just 42 students total in grades 10 to 12. Estonian in not thriving here: only two students have opted for all-Estonian secondary education and they will both graduate this spring. Every year 10 – 13 Estonian kids finish primary school here, but they don’t continue learning in the local secondary. When entering the school building, Russian signs and posters welcome visitors and it is the main language in the corridors. Anton Resik (in the middle)- one of the two students who study curricula in Estonian at Peipsi Gümnaasium. Photo: Meelis Meilbaum, Eesti Meedia. 18-year-old Anton Resik is one of the two students who study curricula in Estonian there. All of his primary school classmates went on to study in Tartu or Jõgeva. What made staying easier for him is that he speaks both Estonian and Russian. His mother is Estonian, his father Russian. He spoke to us with his friend and classmate Alina Krivoglazova, who, unlike Resik, studies in the 60/40 curricula. “Some of our classmates do not understand Estonian too well, but when they struggle, we help them out,” she said. “Studying together helps the two communities come together and communicate better. It’s a way to find more friends,” Anton added. Both Alina and Anton studied Estonian history in the 10th grade under Neeme Kook, who has been a teacher in the Peipsi Gümnaasium for the past six years. Although the classes are supposed to be all-Estonian, in reality they are not. “In practice, when I talk about something in Estonian, I usually have to repeat it in Russian as well,” he said. Otherwise, not all the students would be able to discuss the topics and learn what they are supposed to. “If I only taught 10th graders in Estonian about the period of Russification – how all schools had to teach in Russian and how their knowledge was affected – not everyone would understand. But it is an important topic and I want them to understand it,” Kook explains. Although merging different cultures under one roof has not been easy, a recent study by a group of social scientists from the University of Tartu’s Narva College showed that the merger has had a positive effect on students, regardless of the language they speak at home. The study indicated that students from Russian-speaking families do better when learning Estonian if they’re surrounded by their Estonian classmates. On the other hand, students from Estonian-speaking families become more emphatic and improve their language skills. “Students are doing well and they’re happy. That’s the most important conclusion,” said Jelena Rootamm-Valter, who led the team of researchers. The study also covered the impact of fears. Students from Russian-speaking families admitted that before joining the “joint gymnasium” they were afraid of what lay ahead and whether they will do well in terms of academic performance. “But if they made that decision – knowing there would be some hardships – they were motivated to do their best,” said Rootamm-Valter. When it comes to students from Estonian-speaking families, they admitted to not having any substantial fears connected to studying. This meant they weren’t ready for the difficulties ahead and that had an effect on their ability to adapt. Non-surprisingly, the study showed that the best “adapters” were students from bilingual homes, just like Anton Resik in Mustvee. At the same time, Rootamm-Valter says, they have the biggest burden because they act as mediators for students from different backgrounds. Both principals, Heidi Uustalu and Arne Piirimägi, agreed that Russian and Estonian children should start learning together from an early age, not only in secondary school. “It would be more effective if the process started with the first grade. There should be one Estonian school, not two different school systems,” Uustalu, the head of Kiviõli’s First Secondary School, said. In her opinion, that’s where the problem of the language gap in later years lies. Students coming from Russian schools have very poor Estonian skills when they start secondary school. “This means that we need to put a lot of time into Estonian language studies,” Uustalu said. There are intensive language courses when Russian children enter secondary school, and in the first months teachers will create simplified texts and tasks so that newcomers can get on track and enjoy the learning process. The question of if and when the primary level should go from the Estonian and Russian system to only Estonian (with the similar 60/40 model as well) has been raised in Estonia since the secondary level reform started. Differences between Latvian and Estonian schools. But it’s a tough one for politicians since it affects one-fourth of the population and would not be popular in the eyes of the Russian voters. There have been some attempts with draft bills in the parliament, but they’ve come from the opposition and have not been successful. If you like our work support us!